The RWF World Tree of Hope is a gift to the San Francisco Bay Area and the world from the LGBTQ (lesbian, gay, bisexual, transgender, queer) community. It is the largest annual origami decorated holiday tree in the world, decorated with over 17,000 origami cranes and stars. Each crane or star is hand folded and inscribed with wishes for the future of the world. It is created by RWF to inspire hope and to encourage people to think about what they would like for the future of the world, and then take action. The tree illustrates that while a single person’s offering is valuable, the collective effort of many possesses great power and strength. If each person would do just one small thing that is good for our world today, we will be better off tomorrow than we were yesterday. Designed as the world's most unique holiday tree, people worldwide can help decorate the tree by simply sharing their wish for the future. Wishes are sent in from around the world by mail and online at http://www.worldtreeofhope.org The wishes come from people of all ages, all faiths and all walks of life. The wishes are then printed and folded into origami cranes by a diverse team of volunteers including members of San Francisco's LGBTQ and Japanese American communities, survivors of the Hiroshima atomic bomb, local children, and life-sentence prisoners from San Quentin. The origami "crane wishes" are then placed on the tree. Submitting a wish for the tree is free and open to everyone. Wishes will be added to the tree throughout December and are accepted year round. Over three hundred people come together, donating over 2,500 hours to create the tree. Notable wishes on the tree include President Barack Obama, Dame Jane Goodall, Secretary of State Hillary Clinton, Arianna Huffington, Congresswoman Nancy Pelosi, Isabel Allende, San Francisco Mayor Ed Lee, Lt. Governor Gavin Newsom, Jennifer Siebel Newsom, Mariela Castro, Mātā Amṛtānandamayī Devī, Shirley Temple Black, Frances Moore Lappe, Danielle Steel, Patty Duke, Sharon Gless, Courtney Cox, David Arquette, Phyllis Diller, Stanlee Gatti and RuPaul. The official tree lighting ceremony and party will take place on Monday, December 3 from 6:30 p.m. to 8:30 p.m. Featuring a concert by the Grammy winning San Francisco Boys Chorus ● Emcees Cheryl Jennings and Donna Sachet ● Consul General of Japan Shoichi Nagayoshi will exchange peace cranes ● Emcees Cheryl Jennings and Donna Sachet ● Origami Artist Linda Mihara ● Rainbow World Fund Founder Jeff Cotter ● The Sisters of Perpetual Indulgence will bless the tree ● and much more! Admission is FREE. 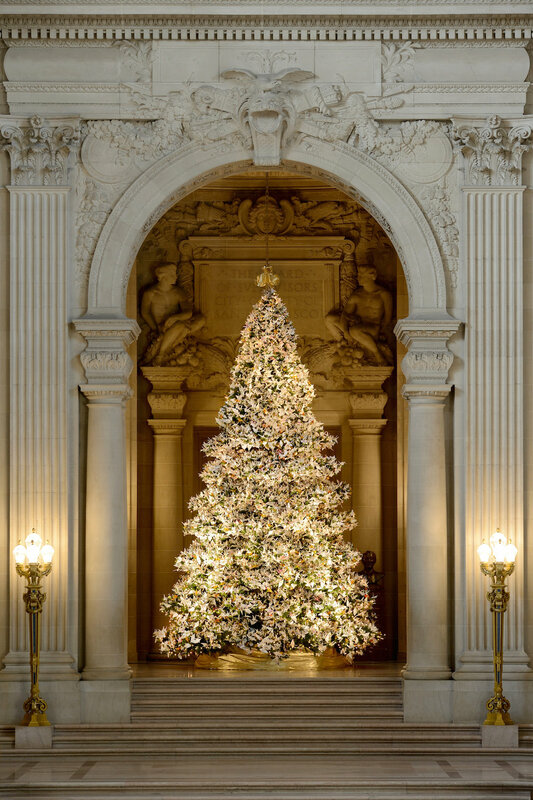 The RWF World Tree of Hope will be available for public viewing at Grace Cathedral, 1100 California Street, San Francisco, from December 1, 2018 to January 6, 2019. The RWF World Tree of Hope is made possible through the support of the many volunteers and donors including: members of San Francisco's LGBTQ and Japanese American communities, Friends of Hibakusha (local survivors of the Hiroshima atomic bomb), Kid CAT (life-sentence prisoners from San Quentin), Alpha Phi Omega, University of San Francisco chapter, Japanese Community Youth Council, the Junior League of San Francisco; The Bridgemen; One Brick, National Civilian Community Corps, Galileo Academy, and Salesforce. For more information, contact RWF executive director Jeff Cotter, at (415) 608-5333 or jcotter@rainbowfund.org. Press information and tree photographs can be found at http://www.worldtreeofhope.org/media. Rainbow World Fund’s (RWF) mission is to promote peace, unity and hope by leading the LGBTQ movement in participating in local and humanitarian relief efforts. Founded in 2000, RWF is the world's first and only all-volunteer, LGBTQ-based humanitarian aid organization. RWF works to help people affected by natural disasters, hunger, poverty, disease, oppression and war by raising awareness in, and funds from, the LGBTQ community to support relief efforts around the world. RWF provides a united voice, a large visible presence both in the United States and abroad, and a proven structure to deliver LGBTQ charitable assistance to the larger world community. RWF currently supports projects focusing on global HIV/AIDS, water development, landmine eradication, hunger, education, orphans, and disaster relief worldwide. RWF is the first and only LBGTQ based humanitarian aid organization. RWF also works to raise awareness of the charitable contributions of the LGBTQ community, and to establish connections with non-LGBTQ communities. RWF programs increase LGBTQ visibility, serving as a platform for LGBT compassion and concern. RWF’s philosophy is that we are all “One Human Family” and that we are living in a time that tells us that our survival on this planet depends on us all giving more to each other. Wishes for the RWF World Tree of Hope can be sent to Rainbow World Fund, 4111 - 18th St. #5, SF, CA 94114 or via the RWF World Tree of Hope website: http://www.worldtreeofhope.org Wishes are collected year-round and are added to the tree throughout December. Wishes may also be recorded in the guest book at San Francisco City Hall. THE WORLD TREE OF HOPE - A 23-foot holiday tree decorated with thousands of white origami cranes, each containing written wishes of hope & peace from children and individuals from around the world. Wishes can be submitted online for free at http://www.worldtreeofhope.org The wishes are printed, folded into origami cranes and placed on the tree. Be part of this unique symbol of global unity and hope! 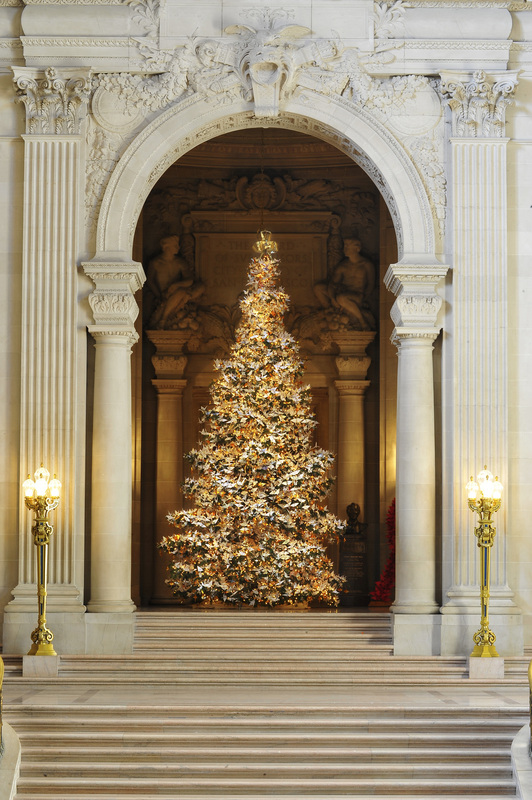 WHEN: THE WORLD TREE OF HOPE will be on public view from December 1, 2018 – January 6, 2019 during public hours at Grace Cathedral, 1100 California Street, San Francisco: Open daily from 8 a.m. to 9:30 p.m.
OFFICIAL TREE LIGHTING: Monday, December 3, 2018 from 6:30 p.m. to 8:30 p.m. at San Francisco City Hall - Featuring a concert by the Grammy winning San Francisco Boys Chorus ● Emcee Donna Sachet ● Origami Artist Linda Mihara ● The Consul General of Japan will exchange peace cranes ● Rainbow World Fund Founder Jeff ● The Sisters of Perpetual Indulgence will bless the tree ● and much more! Admission is FREE. Wishes will be added to the tree throughout December 2018. Submitting a wish is free!